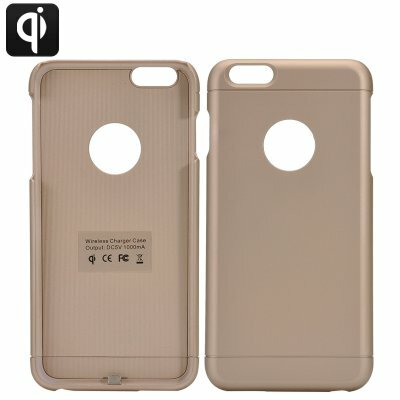 Successfully Added iPhone 6 Plus Qi Wireless Charging Case - Tough PC + ABS Case, WPC 1.1.2 Compliant (Gold) to your Shopping Cart. Keeping your iPhone 6 Plus safe while bringi added functionality allowing it to work with Qi Wireless Charging pads. Despite its many features the iPhone 6 plus doesn’t come with Qi wireless charging, but with this stylish case you can easily add this groundbreaking functionality to your iPhone 6 Plus and enjoy hassle free wireless charging. The case is WPC 1.1.2 complaint so it works with nearly all wireless chargers and operates between 100 to 205kHz. The case was especially designed for the iPhone 6 Plus models so fits it like a glove. This makes sure it keeps a firm grip of your phone and ensures a high level of protection that you wouldn't get from most universal protective cases. The golden case is the perfect complement to the iPhone 6 and with its thin slim design and matching color it’s hard to notice the case is even there. Unlike some phone cases there is not fighting to put this one on your phone and its easily connected to the phones lightening connector. Using magnetic resonance charging the case brings wireless recharging to your phone so you can charge without the need for wires or messy cables. Simply place you phone into the case and click the base in to place. Suitable for use with Nexodus LifeLine [CVAGF-A536 ], this iPhone 6 Plus Qi Wireless Charging Case comes with a 12 months warranty, brought to you by the leader in electronic devices as well as wholesale Qi wireless charging cases..